Scott County Sheriff's Office honors young adults. Zachary Calhoun, Christian Calhoun, and Rebecca Peters helped a man who attempted to commit suicide back in March. SCOTT COUNTY, Va (WCYB)-- Three young adults are being called heroes after they saved a man's life last month, NBC affiliate WCYB reports. 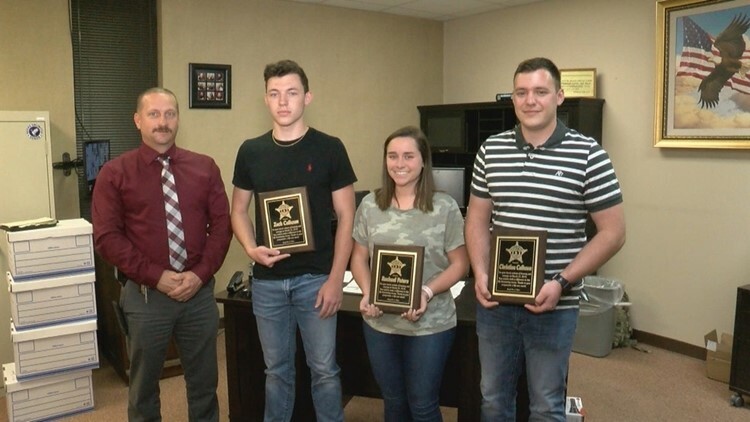 Scott County Sheriff Chris Holder surprised the three young adults with plaques to honor their heroic efforts. The man shot himself in the face by a creek near the family's farm. Christian Calhoun was riding a motorcycle on a road near the house and noticed something was wrong. "I saw his arm waving around, and I didn't know what it was," Christian said. "I pulled up closer, and the guy was laying in the ditch, and he had blood all over his neck." Christian quickly went and grabbed his brother Zachary Calhoun, and his cousin, Rachel Peters, and told them to help. “When I rode down with them I took toilet paper... I took a whole lot of it... and put it on his wound on the neck, and I held pressure there," Zachary said. Peters said she called 911. "Then I went down with them, and gave them my flannel to give him instead of using the toilet paper to hold pressure," she said. Sheriff Holder said the man was taken to the hospital by a helicopter. He survived his injuries, and is doing well. Holder presented the three young adults with plaques on Friday, April 12. He says if it weren't for them, the man probably would not have survived.